After a morning scything nettles to clear and open paths at Lemsford Springs Nature Reserve and an afternoon of gardening, snoozing and enjoying some fine England bowling in the cricket I headed out this evening to enjoy the last of the weekend with camera in hand and hide on my back. The sun was heading for the horizon, hidden behind high cloud and the light was flat and failing, but a gentle creep up the side of the plantation put me in position to spend a pleasant hour watching a pair of our local hares as they nibbled grass on the fringe of a field of oilseed. The hares are a constant presence in the valley and I spend a lot of time watching them. I’ve stalked them in the unspeakable cold of the winter, watched them with their young in summer and seen them in large gatherings gambling in the harvest stubble of early autumn. 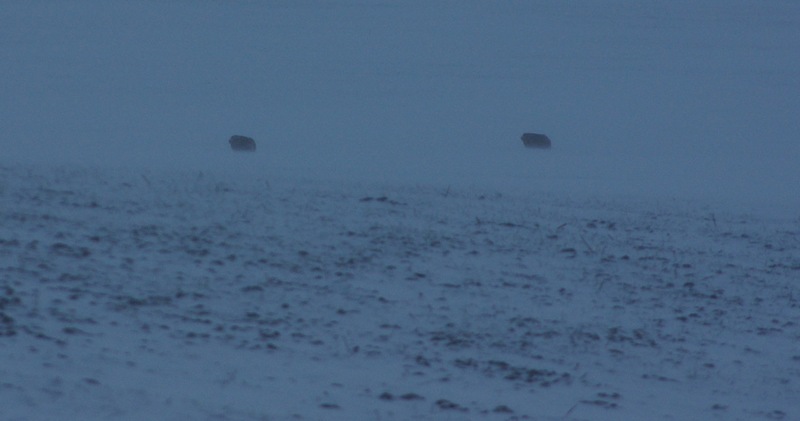 Watching the pair this evening in the warm glow of early summer, pressure high in the barometer, the barren snowfields and howling blizzard winds that they had endured in the same fields back in February, only 4 short months ago, was from a different world. Tonight they were lazy and relaxed, gently descending the hill and coming close to the hide I’d hidden behind some low hazel saplings. The low light made pictures tricky but it was a pleasure to witness some of the character and behaviour of these guardians of the fields and meadows – I appreciate their continued tolerance of me in their environment. I left them at peace and turned my attention to the dissolving sunlight that added flame to the north-western horizon – another weekend drawing to a close. Lovely. Sweet hares. Beautiful sunset. Hares are such lovely animals, these are wonderful photos! They are so wonderful to watch and I can fully understand your appreciation of them.